AzonMobile wants you to be informed about what is happening in the mobile world and gives you the tips and tricks in creating a mobile Web site that works, QR code, as well as other mobile marketing best practices. In a previous article titled, ‘Why You Should Create an HTML5 Mobile Web Site Instead of Mobile Apps,’ we told you about the many benefits of creating a mobile Web site rather than a mobile app. 1. You have more control of what features you want to offer and how people use your mobile Web site. 2. You are not at the mercy of app stores. That means that you only have yourself to listen to. For instance, Apple's App Store has been banning a lot of legitimate mobile apps because it has social sharing functions. If social sharing is a major part of your mobile marketing, you would have to rethink your app all over again. With a mobile Web site, you do not have to care about what Apple's policies are when it comes to creating a mobile Web site. On top of these two, mobile app development might prove to be more expensive than when you just create a mobile Web site. In fact, if you have tools such as AzonMobile's Mobile Web Builder, you can create your own mobile for very little compared to when you hire professional mobile Web designers. 1. You could engage people easier through a mobile app. 2. Users could download these apps, so it stays on the users' smartphones, which means that your mobile app will always be in their menus thus keeping you under your customers' radar! 3. You do not need a compatible browser to run a mobile app. Conversely, it is worth noting that not all browsers available today fully support HTML5 at the moment. 4. 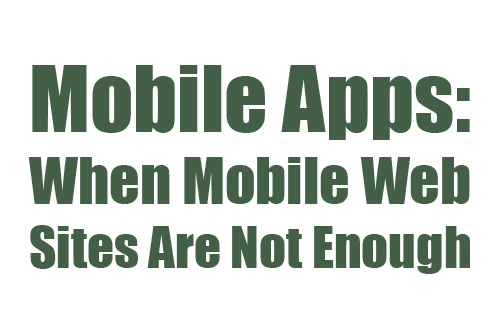 Mobile apps are much more suited to a smartphone environment. 5. More people prefer to download a mobile app than just trying to access it inside! But remember, close to 3 out of 4 people think that a smartphone app should be easier to use than a mobile Web site. Close to a quarter, however, have had negative experiences with an app. Also, once you give users a bad experience with your app, they are more likely to download your apps in the future, like a new version of that app. Well, you need to determine which projects, products and other information are best marketed by mobile apps, mobile Web sites or one of these. If you have a clear picture of what your customers need, you have to objectively see if it is feasible and easier to use a mobile app rather than a mobile Web site. You should also look into your content. There are some content that are better suited for mobile apps, such as games. And then there are those that are best for a mobile Web site.